CES 2015 highlights - Day 4: Arcam, Sharp, TV tech, HDtracks | What Hi-Fi? After its three first action-packed days, you could have been forgiven for thinking that things start slowing down at CES 2015 – but Day Four proved that simply isn't the case in Las Vegas. Not only did the news and product launches continue to flow from the show on the fourth day, but the first of our exclusive interviews from the CES International News Stage have arrived and are now available for you to check out. And don't forget to stay tuned to whathifi.com on Thursday 8th January, with our Stars of CES being revealed at 3pm PST - 11pm UK-time. 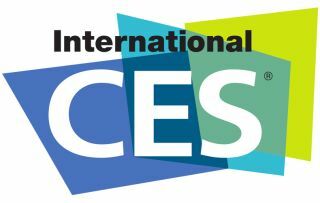 For the first time and in conjunction with our sister publication, Stuff, we have hosted the CES International News Stage at CES 2015 - bringing you exclusive news and interviews from leading industry figures. If you've been following the development of high-resolution audio in recent years, the name HDTracks may well be a familiar one. We spoke to CEO David Chesky about the service, its future and more. The striking news from Arcam over in Las Vegas has been the preview of its new Solo Movie home cinema system, which features HD audio decoding and aptX Bluetooth streaming among its specifications. Due to make its European bow at the High End Show in Munich, Solo Movie is expected to retail for around £2000 here in the UK and can play Blu-ray, CD, DVD-Audio, DVD-Video and SACD discs. It's been in the pipeline for a while now - albeit in prototype form - but now Sharp has confirmed that its SD-WH1000 will be released this year, streaming high-resolution audio and HD video wirelessly. The device can receive 24-bit/96kHz audio from a NAS over wi-fi, a hard drive via USB or through a DAC, while it will also send high definition 1080p video to your TV. CES wouldn't be the show it is without some of the more individual products on show, and a collaboration between Polk Audio and Thomas & Darden has produced one such item that caught our attention. Kube is the device that solves the age-old problem of deciding whether to take a portable speaker or a cool box with you to the park or beach - because it combines both. Not so much outside-of-the-box thinking as in it?